Our blog today is bustling with excitement as we officially announce our first expansion into Baltimore County, with our new offices in Towson, MD! 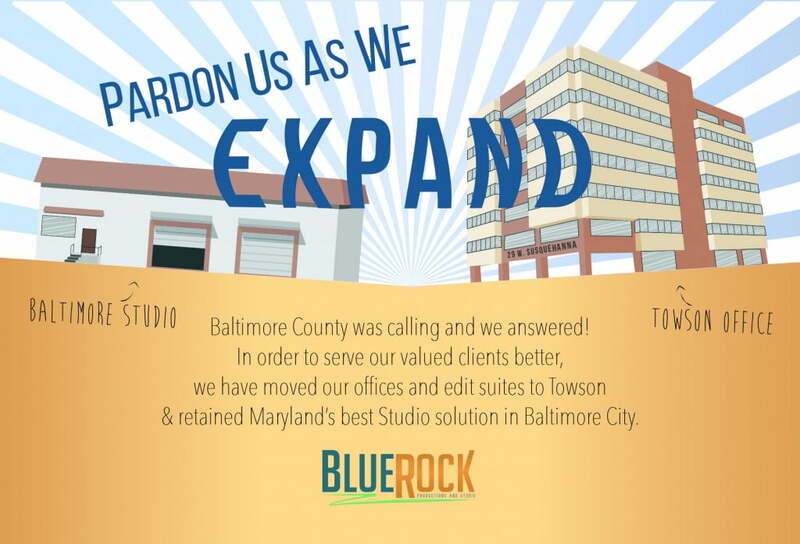 The good news is, our 22 year ongoing operations in Baltimore city are continuing in our studio facility on Amos Ave.
We are enjoying the best of both worlds by retaining the Baltimore area’s most capable and active studio, and providing a new and exciting meeting/editing space in the dynamic and expanding Towson market. Bear with us as we work out some of the kinks in the transition, but our contact number is still 410-358-7000 and my email address is still gregg@bluerockproductions.com. If you happen to be in the area, please make an arrangement to stop by our new digs in suite 303 of 29 W. Susquehanna Ave, Towson, MD 21204. Mail can be directed here or to the Amos avenue address you are used to. As I look out my wall of windows to the mix of buildings and beautiful green space here in Towson, I am very excited for the new opportunities this expansion has in store for us. We look forward to being part of your success in the coming weeks and months!